I can’t stop watching the videos and reading the posts from the Sacred Stone Camp. This is the effort by the Standing Rock Lakota in North Dakota to protect their water and culturally significant sites from the Dakota Access Pipeline. (Find our more here .) Even though I live a 7-hour drive away from the camp, I feel connected to this struggle as I watch live streaming of warriors chaining themselves to bulldozers, women singing to water, tribes from all over the world arriving ceremoniously to cheers and tears, canoes from the great nations of the Pacific Northwest being launched into the Missouri River, and so many beautiful faces and voices speaking on behalf of water and the Earth. We can be connected, even though, incredibly, mainstream media has been slow to cover this event. I am cherishing this connection. Modern tools give access, but Water is the connector. The water protectors of Standing Rock say, “Water is life (mni wiconi).” They are acting on behalf of everyone who needs water, which is all of us. It doesn’t feel like a coincidence that this upwelling of devotion, service, and action takes off like a stampede during the Virgo lunar cycle. This season invites us to usefulness. It isn’t enough to value the water, we must become protectors, devotees of water too. Virgo helps us realize that devotion sustains action. Virgo is the mutable earth sign. Mutability and multiplicity go hand in hand. There isn’t just one way to be in service to the sacred. There are many ways—from prayers to chains to canoes trips—the Virgo season encourages us to get busy. At the beginning of this lunar cycle, I wrote* about the reasons this lunar cycle feels more potent and represents an opportunity to make huge shifts. One of these influences is that we are in an eclipse cycle right now. The New Moon on September 1 was a Solar Eclipse along the North Node in Virgo. 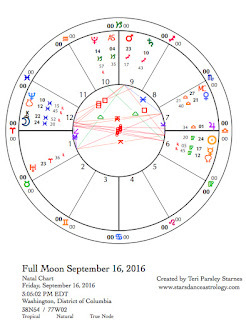 The Full Moon on September 16 will be a lunar eclipse conjoining the South Node in Pisces. The Nodes of the Moon represent processes of destruction and rebirth. Imagine the nodes as a dragon, as Vedic astrologers still do. The North Node head of the dragon is a place to acquire new energy. The South Node is the tail, surrendering and transforming what must pass. Like dragons, we are hungry for Virgo devotion. And we pass along to the great cosmic compost pile, our old experiences of Pisces. Pisces as a water sign holds memories. As mutable water, these memories create meaning. Perhaps what we are releasing are old memories, the stories that have fueled the traumas of our world. An eclipse is an opening to new insights. The old light fades. Darkness washes us. A new light comes. Mercury continues to move retrograde through Virgo, encouraging us to stay open to the unexpected. We don’t need to know where the path is leading if we let devotion to life be the purpose. The heart of this retrograde happens when Mercury conjoins the Sun on September 12. Mars in Sagittarius makes a square to the Sun and Mercury at the same time. Chiron in Pisces opposes Mercury/Sun forming a t-square aspect pattern for the week. Whenever Mars is involved, the opening to anger or violence is there. However, other possibilities exist. Try this on: With Chiron in Pisces, we open to devotion to water and the vulnerability of that devotion. With Mercury and the Sun in Virgo, we seek to serve and heal, and through Mars we act as protectors and warriors of truth. Because of the stressful nature of a t-square, we will encounter challenges under these influences. Stress levels could be high. People are more reactive. However, with patience breakthroughs may happen too. Just now, to take a break from writing, I went to scrub my tub. I couldn’t help but realize that this is a Virgo-inspired reaction to the vulnerability of devotion. The things we love may die. And even if they don’t, we will. Loss is implied in every act of devotion. Virgo is a sign of devotion, but as a pragmatic earth sign, sometimes feels at a loss when this vulnerability arises. That is when we get the signal to scrub the tub. Do you notice this in yourself? As Mercury unties some of Virgo’s knots and as the Pisces Full Moon opens us up even more to the pain of devotion, we have the opportunity to notice our reactions and to consciously choose what we do with them. It isn’t always a bad thing to clean the tub. Monday, September 12. The thought of clarity coming from the heart of a Mercury retrograde period, may strike you as funny. Sometimes it feels like the best strategy for Mercury retrograde is to surrender the hope of any clarity at all. Accept befuddlement! However, the nature of the Sun is to illuminate, and that happens today when retrograde Mercury in Virgo conjoins the Sun. This conjunction occurs in the center of every Mercury retrograde cycle. I think of it as the heart of the retrograde. From the heart, we are offered the lessons of this particular cycle. Virgo likes order. Likes to know what is going on. What happens when we want control but can’t have it? How can we work with our befuddlement? A square to Sun/Mercury from Mars in Sagittarius makes this particular conjunction very interesting. The temptation to get angry is high when things don’t go the way we expect them to. Chiron in Pisces (opposing Sun/Mercury and square Mars) completes the t-square pattern. Chiron entered Pisces in April 2010 just as the Deepwater Horizon oil spill happened in the Gulf of Mexico. Since then, water issues have continued to gain our attention. Now, water protectors are struggling against the Dakota Access Pipeline’s threat to water. An element of trust is needed when we can’t control what is happening. Be open to hearing messages about that trust today. September 13—Gibbous Moon: Perfecting. The dynamic tension between earth sign Virgo (Sun) and air sign Aquarius (Moon) creates an environment ripe for discovery and invention. I think of this combo as the sign of the scientist. It could be helpful to approach this phase of the Moon as a scientist would. What are you observing about your lunar intentions? Are you getting the results you expected? What has surprised you? It may be that you still need more time before your results are conclusive, however. We aren’t even half way through the Virgo lunar cycle. This is a good time to tinker with your intentions. I approached this Virgo cycle with an intention to fine-tune my work without caving into perfectionism. With Virgo’s devotion to service, I‘ve been seeking the sacred source of my work. So far, my biggest lessons and inspiration come from witnessing the efforts to protect the water and land at Standing Rock. Effort mixed with devotion can create miracles. Today, the Sun in Virgo forms a square to Mars in Sagittarius. The desire to act is strong. Anger, passion, and will must be tempered with discernment. This could feel frustrating but can also teach about patience. We are far from finished with the work that needs doing. Wednesday, September 14. Action and change are supported by the Aquarian Moon’s zeal for revolution. The Moon makes favorable contacts with Mars in Sagittarius and Uranus in Aries. Later this week (September 17), Mars and Uranus perfect their trine. These two planets encourage each other to forge new pathways and break down old barriers. Today’s idealistic and eccentric Moon pushes us to begin. Thursday, September 15. Yesterday may have been feisty. Today is fraught with emotion and passion. The Moon in Pisces loosens the dam that has been holding back our emotions. They flow freely again. This may be welcomed by some and cause retriggered trauma in others. Some may react with anger. Some with an overwhelming desire to help others. The aspects are juicy and complex. The Sun in Virgo opposes Chiron in Pisces, while Mars makes an exact square to Chiron. The Sun also makes a quincunx to Uranus in Aries. In addition, tomorrow’s Full Moon, which is also an eclipse, is strongly anticipated, amping up all the feelings. Read tomorrow’s forecast to hear about these aspects influencing the half-way point of this Virgo lunar cycle. Emotion is a powerful motivator. Mars in Sagittarius desires freedom and truth. Chiron’s influence in a water sign draws our attention to this precious resource. Many indigenous people describe water as the first medicine. As Chiron is known as the first healer in Greek mythology, we are returning to this wisdom. September 16—Full Moon: Illuminating. Lunar Eclipse. Over the past week, we’ve been building to this peak of the current lunar cycle. Mars in Sagittarius has been an activator. Highly passionate and idealistic, this Mars is the focal planet of a t-square pattern involving Chiron in Pisces, the Sun in Virgo, and the Moon in Pisces. Mercury has been in stealth mode (retrograding through Virgo) acting as the collector and disseminator of information from behind the scenes. Saturn in Sagittarius and Neptune in Pisces are exactly square, having just perfected the last of three transits between them on September 10. If I were going to synthesize all this (and I am, it is what I do), I’d say that devotional service has opened emotional reservoirs, releasing memories and experiences of vulnerability and idealism. Mars provokes action and reaction. Not everyone agrees. We are seeing clear demarcations in belief and values. Messages may seem clear but it is imperative that we give them our second thoughts. Mars can be harnessed, as the Water Protectors of the Sacred Stone Camp in North Dakota are showing us, for peaceful actions that further the causes we believe in. Perhaps that is the most telling way to discern whether an action is right. Is it peaceful? Does it further the health and vitality of the Earth? Are people being respected? Are we placing the values of wealth and progress beneath these essential things? An eclipse is an opening, a doorway to a new perspective. Sometimes, this is unsettling, especially if we haven’t been paying attention to the signals that change needs to happen. No one is exempt from change. If we let Virgo take free rein in our hearts, we are able to commit 100% to the causes we believe in. This can actually feel very vulnerable when there are no guarantees and when we can’t really see where it is all leading. The Pisces Moon, presenting a mirror to Virgo, encourages faith and surrender to outcome. As we seek illumination, let us also invoke flow and trust. The square between Saturn and Neptune indicates we are experiencing global evolution. Old belief systems are being shed. We are also seeing the ways that the old systems want to survive. Change is not happening easily, yet there is momentum. The time is ripe to add our actions and prayers to create new paradigms. Gender justice and activism plays a role in the remaining half of the lunar cycle. An opposition between Venus in Libra and Uranus in Aries will perfect on September 18. Venus demands justice and we are shaken out of complacency by Uranus. Saturday, September 17. The Moon in Aries amps up the fiery energy of Mars in Sagittarius in trine aspect to Uranus in Aries. Where I live, we know that summer is coming to an end when the hornets get restless. They can’t seem to settle anywhere. It is as if they know change is coming. You might be feeling the same way today. The Moon opposes Jupiter, which has just entered Libra for the next year. You may notice the shift. Libra seeks balance, justice, and elegance. Relationship is the means to achieve these. Venus in Libra makes a puzzling quincunx aspect to Chiron in Pisces. Remember to honor emotional awareness, even as we expand into action. Sunday, September 18. Aries is good at leaping before looking. You may notice yourself doing a bit of leaping today. The Moon in Aries comes in contact with Uranus in the same sign. Yesterday, Mars in another fire sign, Sagittarius made a supportive trine to this planet of waking up. Today, the Moon boosts the signal. What we lack in finesse is made up by eager passion. Venus is in on the action too. Venus in Libra opposes Uranus and the Moon. Lately, I’ve been thinking about Venus’ role in gender justice. We may notice an awakening around this theme today. Relationships and harmony may suffer due to a zealous desire to bring change. September 19—Disseminating Moon: Sharing. Whew, the Moon coming back to an earth sign may signal a needed time to slow down and restore. Mars in Sagittarius has been calling the shots lately. The Moon in Taurus makes a trine to Pluto in Capricorn and supports the Virgo intentions of this lunar cycle. We can’t be effective servants to the cause if we are exhausted or depleted. Our bodies are constantly communicating, but many of us don’t listen. Change that today, if it is true for you. This phase of the Moon is about harvesting the wisdom we’ve gained from following the path of our intentions. Our bodies have gathered the wisdom seeded by Virgo at the New Moon. What is your body telling you about devotion, service, work? Venus in Libra and Mars in Sagittarius work together to help us expand into action while maintaining equilibrium. This is a nice trick. May we always live in such flow and responsiveness. Tuesday, September 20. Yesterday and today, the Moon in Taurus has been activating a grand earth trine, which may feel particularly potent today since it includes a stationary Mercury in Virgo. Tomorrow, Mercury will turn direct! While doing so, Mercury is also trine to Pluto in Capricorn. This is the aspect to resolve to speak truth to power. Virgo is a humble sign, but when it has righteousness behind it, watch out! All means of communication will be displayed. Mercury, himself, is communicating to our creative ingenuity in the face of power (Pluto). Passion and heart trump perfection and control. Be daring and be humble. Virgo teaches us that small steps are powerful. Join the march. Wednesday, September 21. This advice will give you a leg up on everyone else muddling through these transits: Just don’t expect anything to work right today. There. Let the setbacks, confusion, miscommunication and travel snafus fall off your back. It isn’t the end of the world. At least, I hope not. Mercury stations direct today while the Moon in Gemini makes a grand cross aspect pattern with Saturn in Sagittarius and Neptune in Pisces and Mercury in Virgo. These are all mutable signs so they influence the ways we receive and transmit information. In a grand cross, all the elements are represented and so we might experience a cacophony of data in all the elemental ways: emotionally, physically, creatively, and intellectually. If you have high expectations for success, you may be more frustrated. I have a friend who reminds me to repeat, How fascinating, when things don’t turn out as expected. That might come in handy today. Thursday September 22. Fall Equinox. As the Sun enters Libra, it crosses the Celestial Equator on its way south. For a brief moment, day and night, north and south, reach equilibrium. Those in the northern lands say good-bye to longer daylight hours and those in the southern lands say good-bye to longer nighttime hours. It seems we are always on our way to something else, headed towards a winter or summer. At these balancing moments, it is good to pause and center ourselves amidst the constant change of life. Libra, the sign of the scales, is a good influence on learning about balance. Libra concerns get a boost this year from Jupiter’s recent ingress into Libra. Notice how Libran themes show up for the rest of the Libra month. Jupiter just left Virgo, the sign of the current lunar cycle. As Jupiter loves to make a big impact, all things Virgo seemed to shine a little more with Jupiter there. That isn’t easy to do with such an unassuming sign as Virgo. This isn’t the case with Libra. Libra likes shiny things and doesn’t mind gathering attention towards itself. Balance and beauty are themes. Justice and relationship are others. We may need extra balancing today with the Moon in Gemini still sparking a grand mutable cross aspect pattern (wide orb but still influential). Mutable energy is jumpy—all the more reason to find the still place within. If you can, project ahead to what you desire from this Libra influence this year. The next lunar cycle will be seeded by Libra, and it will be a time to start and strengthen such projects. September 23—Last Quarter Moon: Evaluating. The Sun has left the sign of Virgo but this lunar cycle is still influenced by the Virgo intentions we set at the New Moon on September 1. Although we may not see physical evidence yet, there is a sense that we’ve crossed another boundary. The expansive energy at the beginning of the lunar cycle is turning inward. Just as the days are getting shorter in the northern parts of the globe, the waning Moon encourages reflection and evaluation. What succeeded? What didn’t? What do you take away? The Moon in Cancer welcomes us to the hearth. Mercury, now moving direct in Virgo, makes another exact trine to Pluto in Capricorn. Given the influence of the Cancer Moon, this may show up as a strong desire to nest, improve our homes, spend an evening crafting or cooking. Venus leaves Libra and enters Scorpio. If you are feeling tender and less social, that is OK. We are asked to look at the soulful connections in our lives. Home base is an excellent place to start. Saturday, September 24. The Cancer Moon emphasizes the importance of home, security, family, and nurturance. We may be more aware of the value of these facets of life as the Moon opposes Pluto in Capricorn and makes a square to Uranus in Aries today. Pluto can be threatening. How secure do you feel? We may see others acting out of insecurity. Uranus may provoke reactivity if we are feeling insecure. But Uranus is also the wake-up call. We may see a new side to these issues. The goal may be to be more inclusive and just. Sunday, September 25. The Sun and Jupiter come into exact conjunction after midnight tonight (CDT) but we feel it all day today. Once a year, these two come together to start something big. It just so happens that this conjunction coincides with Jupiter recently entering Libra for the next year. What do you admire about your Libra friends and loved ones? Is it their sense of grace and eye for elegance? Is it the way they can ease tension in a group? Is it the fine-tuned awareness of disharmony and injustice? No, Libra isn’t perfect but I won’t get into that right now. With Jupiter’s influence we want to see the good things in this sign, and there are many. The Moon in Leo feeds all the good things Libra can bring with added joy and playfulness. There is a mild disruption in the field when the Moon makes a mid-day square to Venus in Scorpio. Venus rules Libra after all. It isn’t all bright and light. Thank goodness. * Read about the beginning of the Virgo lunar cycle here.